Agni-VI !!! What’s that? Never heard about it . were the actual words used by DRDO chief Dr S Christopher when asked by media about Agni-VI Program a few months back, while Government and DRDO continue to refuse to confirm or deny existence or development of successor of Agni-V, Chatter around seems to hint that India is just a few days or a few months away from surprising the world by testing China Centric Intercontinental ballistic missile (ICBM) in coming days. Agni-5 India’s first China Centric ICBM recently turned 5 and also underwent its fourth and final test-firing last year and will now undergo at least two user-trials by the tri-service Strategic Forces Command (SFC) before it enters full-scale production and induction, which has lead to wide-scale speculation among Defence and Nuclear analysts worldwide on possible debut of Agni-VI pretty soon . Former DRDO chief Vijay Kumar Saraswat in his tenure had confirmed that India had all the building blocks to develop a longer range and more capable missile then Agni-V and talks about MIRVs (multiple independently targetable re-entry vehicles) capable Agni-VI being under development as been speculated by both Indian and International Defence and Nuclear analysts for a long time now. DRDO usually has development gap between each Agni-series of less than 4 years and Agni-V turning 5 without any successor in sight suggests that Successor at least is ready in semi-knocked down condition which can be assembled in few days for its first debut test flight if given clearance from the top but since DRDO has been so tight-lipped about Agni-VI, it suggests that the final decision will be a political one and reasons to keep Agni-VI under wrapped, might be a Strategic one . 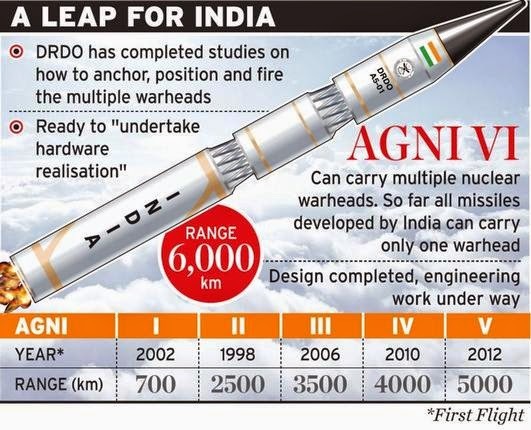 Agni-VI with 6,000-7,500 km range and ability to carry a larger multiple independently targetable re-entry vehicles (MIRVs) payload capability over Agni-V will send shockwaves not only in Bejing but also in all European countries which will be put them under Agni-VI range. Speculation is also there that Upgraded lighter Agni-V might be tested with MIRV Capability with under reported range to pass it off as just an improved Agni-V to keep nerves calm in many countries with whom India is working in trying to secure its entry in the Nuclear Suppliers Group (NSG). All-composite Agni-V with improved components will make it significantly lighter than its current avatar and with MIRV warheads, Agni-V will lead to range extension of 1500-2000 km with a 1.5-tonne warhead and Chinese officials have already debunked Indian claim of 5500 km slated range of Agni-V and have said that it is capable of striking targets 8,000 km away with a lighter payload which technically could mean that with a full payload a lighter Agni-V might be able to strike over 7000km range and with light payload over 9000km and Agni-VI could be 10000km capable ICBM with reported range of 6000km . While DRDO has not made any effort to clear confusion on who will be successor to the Agni-V, Two Successor theories floated around by Defence and Nuclear analysts worldwide and also in India is that to keep heat off its Nuclear Missile program, India might introduce upgraded Agni-V with the same name but with minor design change or with an extensions like Agni-V+ or Agni-VPrime to maintain a low profile of the new missile even if it comes with MIRV warheads and increased range or it might finally reveal Agni-VI but with understated range .